Canada Can researchers bring a brain-stimulation remedy for depression out of clinics and into the home? 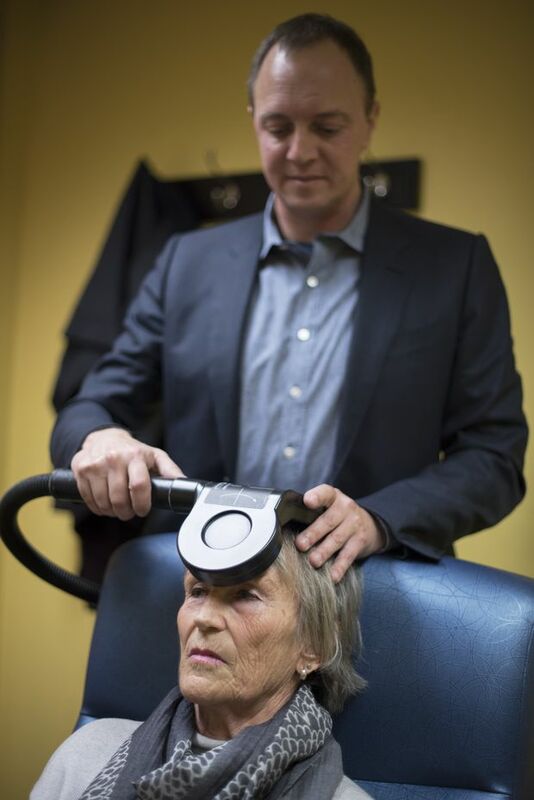 Julie Marriott undergoes repetitive transcranial magnetic stimulation (rTMS) treatment at Toronto's Krembil Research Institute. She commutes from the Hamilton area to treat her depression, which she has had for around 30 years. The bulky equipment and prohibitive cost of the procedure make it out of reach for many Canadians. More below • Graphic guide: How does rTMS work? It’s safe, it’s effective, and it’s been approved by Health Canada for treating depression since 2002. 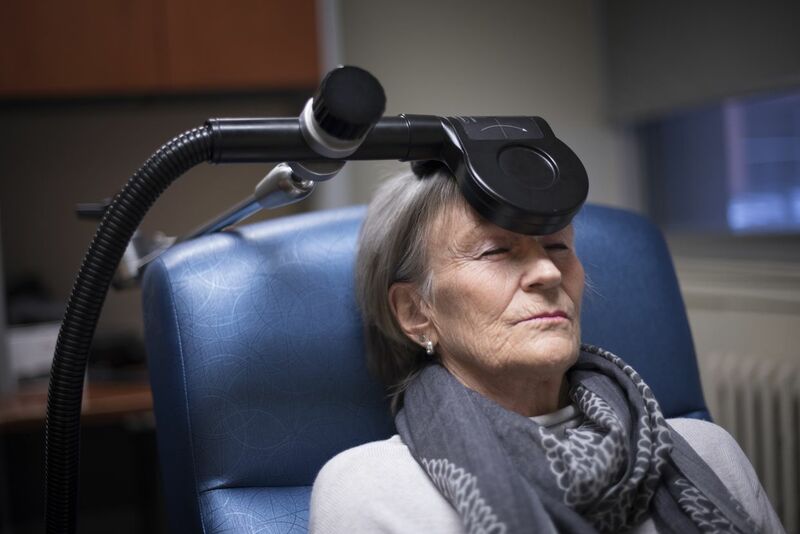 Yet, repetitive transcranial magnetic stimulation (rTMS) – a non-invasive brain stimulation treatment that brings relief to patients who do not respond to antidepressants – remains out of reach for most Canadians because most provinces don’t fund it, and the cost at private clinics can be out of reach. In an effort to make it more efficient, cost-effective and accessible, a team of Canadian researchers investigated a new method of administering rTMS that makes treatment more than 10 times faster. In a large, landmark study published in the journal The Lancet last year, they showed that by using a different pattern of currents, rTMS could be just as effectively delivered in, shorter, considerably cheaper three-minute sessions, instead of the standard 37 minutes. Now Dr. Jonathan Downar, who is a scientist at the Krembil Research Institute at Toronto’s University Health Network, wants to take this work another step further. He believes that if rTMS can be safely, cheaply and effectively self-administered by patients at home, many more will be able to receive the treatment. Dr. Jonathan Downar demonstrates the rTMS with Ms. Marriott. During a typical session at a clinic, the patient sits back in a chair, while a doctor or technician positions a magnetic coil against his or her forehead. The coil generates a magnetic field strong enough to induce currents in targeted areas of the brain to regulate brain circuits that are not working properly. Roughly 30 per cent of patients with depression do not respond to antidepressants. But with rTMS, about 50 per cent see a significant reduction in their symptoms, including 30 per cent who achieve remission. Patients typically need 20 to 30 sessions, as well as periodic follow-up “booster” sessions, since their symptoms tend to return after several months. Dr. Downar is looking to study whether a portable rTMS device that is on the market and already approved by Health Canada can produce the same effect on patients at home as the ones used in clinics. (He declined to name the device to avoid promoting the manufacturer.) He suggests that if his clinic were to issue the devices to patients and show them how to administer rTMS on themselves, it would save them from having technicians or doctors deliver the treatment. Plus, since patients can often go months between courses of treatment, the clinic could lend out the devices temporarily, so that multiple patients could use the same one. If it works, he believes the cost of rTMS treatment could be further reduced to less than $5 per session. Health professionals currently advise against people using any type of brain stimulation on their own without expert guidance. For Julie Marriott, 69, the prospect of avoiding the long daily drive from her home in Ancaster, Ont., to Toronto for treatment and some day being able to administer it in the comfort of her own home, would be a “life-changer”. In the meantime, Dr. Downar and his colleagues say rTMS could be made widely available to Canadians who need it now, if only it were publicly funded. “We need to level the playing field here a bit, and provide access [to rTMS] across the country,” says Dr. Fidel Vila-Rodriguez, director of the non-invasive neurostimulation therapies laboratory at the University of British Columbia. In B.C., he says his clinic, which relies on research grants, is the only site in the province to offer rTMS at no cost to patients. Although rTMS was offered in Victoria from October, 2016, to March, 2017, that program was halted because the treatment is not a publicly funded health care service in B.C., a spokesperson for B.C. 's Island Health, formerly known as the Vancouver Island Health Authority, said in an e-mail. Encouraged by the results of The Lancet study, however, Dr. Vila-Rodriguez, who was a co-author, says he made a submission to the B.C. Health Technology Assessment committee in December, suggesting that it review rTMS for treating depression. The committee is responsible for making recommendations about health services and medical devices to the Ministry of Health. In Toronto, Dr. Daniel Blumberger, the lead author of The Lancet study, says it is important for governments to consider funding rTMS, since it can prevent patients from requiring other treatments, like electroconvulsive therapy, which involves putting a patient under general anaesthetic and inducing a seizure. Electroconvulsive therapy also has the potential for more side effects. Dr. Downar points out that rTMS is covered across the U.S. by Medicare, the national publicly-funded insurance program. And based on the Canadian findings in The Lancet, the U.S. Food and Drug Administration approved of the three-minute “theta burst” form of rTMS in August, allowing U.S. doctors to see many more patients. “It would be nice if Canadian taxpayer funded research actually led to better access for Canadians,” he says. coil against his or her forehead. that are not working properly. 50 Hz repeated five times per second. tions for which rTMS is being tested). repeated five times per second. against his or her forehead.